At present, much of the chatter surrounding the voiding of the amnesty granted by then President Benigno Simeon ‘BS’ Aquino III to “senator” Antonio Tillanes in 2010 revolves around whether that action was legal or not. That is because lawyers enjoy disproportionate celebrity amongst the chattering cliques of partisans that populate the national discourse. But in so focusing on mere legalities, the Philippines’ foremost “thought leaders” miss the more important points surrounding this circus. “Senator” Trillanes was one of a number of Filipino ex-military personnel who mounted a rebellion against the government of then President Gloria Arroyo in 2003 and again in 2006. When he came to power in 2010, Aquino issued Proclamation 50 granting amnesty to Trillanes allowing him to escape accountability for these crimes. This raises questions that should be directed to people who supported that proclamation back when it was first granted. What is the real justification for that amnesty Trillanes enjoyed under Aquino’s graces over the last several years? For those who supported it, we must ask, Why did you support it back then? After all, Trillanes’s crimes were really and truly serious. He betrayed the trust Filipinos gave him as an officer in the military and went off to use the resources under his command to mount an assault on a civilian government and endanger thousands of Filipino lives. What has Trillanes done to make amends for those crimes that makes him deserving of amnesty? It seems that the only things that were going for Trillanes then and up to now were quaint narratives spun by partisans who held personal biases. They [the alleged mutineers] went through elaborate ceremonies which were meant to be symbolic of their noble goal. They seem to have considered their deed a patriotic feather in their cap and they will willingly assert that, yes, we did, even if we now regret having done it. (3) It was in line with Aquino’s aspiring “to promote an atmosphere conducive to the attainment of a just, comprehensive and enduring peace”. Note that in all of the above, there was no reference to the unresolved question of Trillanes’s culpability as one of the senior officers involved in the alleged rebellions made within the tenets of Proclamation 50. Nor was the unnecessary danger he and his team had exposed innocent civilians to in the course of mounting their alleged adventurism even mentioned. So now with all that in hindsight, perform a simple thought experiment and strip off all reference to partisan loyalties and any names associated with such loyalties from the above several paragraphs and ask a similar question: Would you support the granting of amnesty to people who enaged in the above activities? Does “senator” Antonio Trillanes deserve the amnesty granted him by Aquino in 2010 to begin with? See if you can answer that question without referring to any of the Opposition notions and narratives. is pnoy’s proclamation 50 for magdalo mutineers a violation of amnesty law? Pnoy were advised by his U.P.-graduate lawyers and hangers-on to give amnesty to the mutineers of the failed Peninsula Hotel siege that U.P. Binay Family double crossed PMA Trillanes for not showing up for war. Goodness Duterte only have very few U.P. people in his cabinet. Nope, not when their previous coups were pretty much nullified and worthless since Aquino got into power, “Dictatorship” cries Trillanes and his Magdalo buddies, crying that there would be massive cheating by Arroyo and her allies during that election and that people should rise up if she doesn’t surrender power, that’s how I remember it, now on the show cause by Trillanes and the mutineers getting amnesty that pretty much catapulted their careers in politics as Attack Dogs of Aquino who know when to bark and bite at his enemies and then know when to sit down and be quiet when his allies do something wrong, really no cause and if we go with Obstruction of Justice on Aquino and his allies swooping in while the Military was on track to try and sentence them, then we got 6 years of vindictive political witch hunts and attacks, and Daang Matuwid hypocrisy where Aquino really showed his lack of conviction while overall just like a lot of politicians who get away with things if they do their regular “Charm Offensives” and be international media-approved. Now lastly, the biggest insult Duterte can give Trillanes is offering him amnesty, then he can choose which type of humiliation to take. Amnesty is a terrible policy, and it’s terrible politics. It’s a terrible policy because they are rewarding people for breaking the law, especially with the likes of Antonio Fuentes Trillanes IV. First of all, who ordered him to mount an unsuccessful “coup d’ etat ? A lowly officer in the AFP, will never do such “military adventurism”, unless he/she had a strong political patron to back him up. During the term of Pnoy Aquino; he was immediately pardoned by Aquino, his political patron. He became Aquino’s partner in selling the Scarborough Shoals to China. He has no foreign affairs degree or experience. Yet, Pnoy Aquino allowed him to do “Back Door Diplomacy” with China. The Chinese must be amused to deal with this ignorant and naive Senator from the Philippines. So, we lost all the islands on the Scarborough Shoals. The Chinese even built a man made military base, out of the islands. Using the mountains, from the Philippines, as landfills. How stupid can this idiot , Trililing Trillanes can he be ? Pnoy Aquino , his political patron, is similarly stupid. After the 2016 national election; the fake VP Leni Robredo, was installed as a fake VP by the former COMELEC chief, Andres Bautista. This crook was ordered by the Aquino Cojuangco political axis, to do so, as their “insurance policy” to hold on to power. Trililing Trillanes, became the attack dog of the Aquino Cojuangco political axis. He and the crook/drug dealer , Leila de Lima, were working together, to impeach, the duly elected, Pres. Rodrigo Duterte. However, Duterte was a “tough nail” to pull out. Leila De Lima, instead became the “victim ” of Duterte. Now, the Trililing Trillanes, will also be a victim of the “Punisher” Duterte. Trililing Trillanes, just has “bitten more than he can chew”. He thought himself, as untouchable, because, he was “pardoned” by Aquino, and was installed as Senator. The dude is just a military and political adventurist, who think, he is smarter than anybody ! Good riddance ! You may not like trillianes but this is a slippery slope. How can the Philippines be a country of LAWS if no one follows the LAW! This is another example of Filipino short-sightedness. You complain about law breakers but when the law breakers are at YOUR side you are quiet. Pretty much nobody here would be an expert on Philippine laws (aka an actual lawyer), and I would doubt people who claim they’re experts. As far as I’m concerned all of us here are simply anonymous opinions with equal credibility. Now, both sides of this fight are claiming that the law is on their side. Trillanes claims that BY LAW his amnesty should not be revocable, meanwhile the Duterte administration is claiming that BY LAW his amnesty is void in the first place. If I could speculate, it is for the reasons the author stated above – that the amnesty granted by Aquino did not mention Trillanes coup, but I can’t be sure on this of course. It has always been like this in politics, both sides claiming they’re right and both are using the “law” on their side. Whichever your current partisan is, is the one you would probably believe. As such, FOLLOW THE LAW is a very subjective phrase in the world of politics. i think trillanes don’t deserved it because he is not included as a beneficiary of the rules of amnesty law as a military man. And pnoy violated the rules in providing amnesty to the magdalo mutineers. Now, it’s trillanes vs the amnesty rules of law. Not president duterte. what about pnoy? what’s his case in giving amnesty to those exceptions? We are not Lawyers or military law experts, so we do not know, if the amnesty provided by Pnoy Aquino to Trililing Trillanes is legal or not. It is up to the duly constituted Courts/Military Courts , to decide. Otherwise, he can rot in jail. Or be Court Martialed and face the firing squad. Justice in the Philippines is not based in law … it is based on the piles and piles of affidavits are notarized because Filipinos and Filipino lawyers and those that graduated from U.P. Harvard Ateneo and la Salle not heard of FORENSIC EVIDENCE. FORENSIC EVIDENCE is science and obviously FILIPINOS ARE POOR IN SCIENCE BECAUSE THEY CANNOT EVEN SPEAK MATHEMATICALLY the language of science. Do not even believe U.P. students sent satellite to the sky because I see plenty of children fly their kites without science. Has anyone heard whatever happened to the satellite U.P. students launched ? Nada! Zilch! Nyet! You forgot to add U.P. students are mostly left-leaning and had personal agendas. They cry about things like martial law but they let their emotions took over and never use their brains. Aha! Ha! Ha! In U.P. being leftists and noisy protesters are their rite of passage. Scratch every crooks in Philippine government they are likely graduates from U.P. and PMA. Name them. Do the scratchers. You’ll find PMA and U.P. produce more crooks than leftists. It was a patriotic attempt to topple the corrupt leader Arroyo. It was at the height of failed state and corruption in the Philippines and the Filipino people need someone to do something patriotic to represent the true inner sentiments of anger and hopelessness of the Filipino masses. So to answer your question, yes, Trillanes did deserve the amnesty granted him by Aquino because it was a selfless motive not just by Trillanes but all other 30+ magdalo group who shared his sentiments at the time. It was the exact emotions of the Filipino people at the time who catapulted and reward Trillanes, even incarcerated, into the Senate. Clearly, this is another lame and failed political persecution by Duterte who only chose Trillanes to illegally revoke his amnesty just because his department of justice and Solicitor General thought his case was not dismissed and thought he did not apply for amnesty. Another incompetent move by the Duterte admin. This admin is just embarassing itself more. And they should have included all the other 30+ soldiers in revoking their amnesty to look fair and good and not like this which is so selective. Trillanes also deserve it in order to foster peace. To question it, is to question this government on why they are giving billions of funds to the rebel group in the south after all the horrors and atrocities they had cause to the millions of Filipino lives in Mindanao for 40+ years, which is further worst than what Trillanes did back then. But still, Duterte graciously rewarded them with a big chunk of public funds. Also, because Aquino can. He has the prerogative and discretion to do so as a president. Look at now, Duterte gave higher government positions to the nincompoops incompetent like Mocha and Montano among others because Duterte “CAN.” And he allowed his granddaughter to have photos ops inside Malacanang even though it was improper because he “CAN.” So really, Benigno are you not convinced with yourself that you just chew what you spit? To focus on this issue is to leave the more important national issues hurting the ordinary Filipinos today: Inflation rate, the bukbok rice and the pormalin galunggong among many other things important to discuss and to solve rather than this personal stupid revenge of Duterte to Trillanes. you mean to say de lima, sereno, and trillanes are all victims of political persecution or violators of laws? More like adventurism than patriotic. 2003 but Arroyo is still in 2 years in her term. And it’s not even true inner sentiments but more like an emotional rampage. If you try to ask me about whether he deserve amnesty granted by Aquino, it’s a resounding NO. His offense was serious and yet the bald one granted him something he never deserved to begin with. He deserves to be jailed for a long long time. Clearly, this is one of YOU another lame and failed rantings from yourself. If anything, they’re working on this case 2 years ago, as they said, yet the media barely reported that. You’re embarrassing yourself even more, unfortunately. As expected, straw grasping once again. You tend to put a mutineer on a pedestal compared to those rebels in the south. Mutineers and coups want to topple governments, rebels are another story because they have their own agendas. Come on, mutineers ARE also rebels as well. Rebels from the military, at least. Same goes that can be said to Duterte, but you also put a quotation mark next to the word CAN. TBH, Duterte knows how the law works while Noynoy, known for being an incompetent nincompoop with personal vendettas, would like to grant amnesty to Trillanes and 30+ other mutineers and ended up being Aquino’s attack dogs. And some of them still continue this day, by waging “lawfare” against Duterte. I’m totally curious about your obsession with Mocha and Cesar Montano and now you’re putting the controversy with his granddaughter in this? That tells me that you’re thoroughly obsessed by media and how they love to sensationalize things. So really, Yellowtard Citizen, don’t you know about the word red herring? Red herring and ad hominem are the same thing: spitting yourself on your own face. We should focus on more important issues, but the likes of you love to blame Duterte alone for these kind of issues while ordinary Filipinos are still uniformed on these things, which is stupid. You keep on accusing everyone who disagree with you being Duterte asskisser while you’re an asskisser to Trillanes. That says something. Who is your law professor? a) the same person who said DAP is legal ? b) the same person who was onion skinned with the Cyber law? c) the same person who is shirking responsibility from Sanofi/ Dengvaxia? d) the same person in your words had allies in the COMELEC who went missing after the discovery of their bloated bank accounts. You absorbed his legal lessons well. Unfortunately your law professor had zero accomplishments in his whole life and begged the country to vote for him merely because his mom died at the right time. Not to mention what you define as “patriotic attempt ” boils down to your law professor being kilig over the accused. The Law Professor must be graduate from University of the Philippines no doubt about it. pnoy and gazmin will be next to explain the legallity of amnesty they gave to magdalo mutineers. what’s the penalty for violating the amnesty law? Go president Duterte, clean up the pilipino society, that’s what the citizens want done. PERIOD. 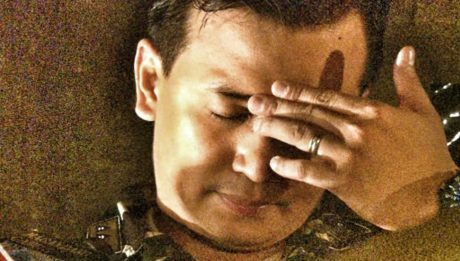 “MILITARY mutineer Sen. Antonio Trillanes 4th, and his Yellow gangmates, thought that President Duterte’s offensive against him would end up portraying him as a hapless victim and trigger people’s anger against the administration. What is happening is exactly the opposite. Proclamation 75 must be REVOKED for TRILLANES. The underlying principle of the Amnesty is premised on promoting an atmosphere conducive to the attainment of a just, comprehensive and enduring peace in line with the Government’s peace and reconciliation initiatives. Hence, those given amnesty must adhere to enduring peace efforts in consonance with Government’s initiatives, REGARDLESS WHO the President is. With the change of administration and the Presidency, all Trillanes had done was to destabilize the administration. He had constantly berated and accused the President of wrong allegations in front of national TV and journalists without shred of proof or evidence. He cuddled notorious personalities like Matobato and Lascanas, just to stop the anti-illegal drug campaign efforts. He is questioning and accusing the President of his wealth on BPI bank, with dubious motives and contrary to rule of law. He questioned the family of the President, specifically Paolo on his back tattoo, which he allegedly claim to be a sign of drug syndicate membership. He continuously incites the soldiers and people to act against the President as evidenced by his threats and dare in front of media personalities. But sadly, he would evade the critical issues like the South China Sea flash point, being the back channel negotiator before during the Aquino admin as evidenced by his multiple trips to China. Trillanes is insanely obsessed in putting down Duterte. This was.after he approached Duterte to be his running mate before the 2016 national elections but was rejected. His goal is power and authority, but Duterte denied him this. Trillanes is a narcissistic sociopath who’s bent on reaching his goal of public adulation and power whatever means it will take, and will put down any hindrance to this. Just the way he grossly humiliated and shamed the former General Reyes in front of national TV, where he took his life as a true warrior days, after. Hence, from all his selfish actions, Trillanes had violated the underlying principles of his Amnesty and must be revoked. it is as simple as this, president duterte and trillanes knew very well that you cannot grant amnesty to military men and government leaders. It’s against the law. And now he (trillanes) has a new case of inciting to sedition. And pnoy and gazmin violated the amnesty law by granting amnesty to trillanes and his mutineers.